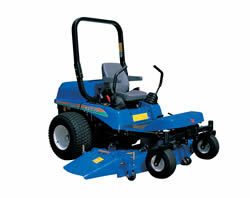 Iseki Zero -Turn Mower SZ330 Series with enough high power diesel engine provide efficient performance for mowing. A machine can be operated by two maneuverable HST levers and performs 360 degree turning radius to eliminate uncut area surprisingly. 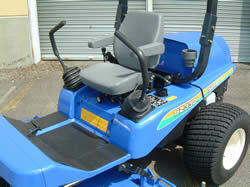 Its solid and robust structure, wide mower deck will leads professional to satisfaction. 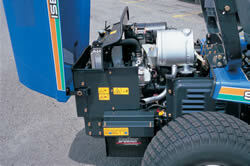 Three-cylinder 32PS water-cooled diesel engine enable an operator adequate mowing even on a hill. The 30 liter large capacity fuel tank provide with operating for long periods without re-fuelling and a user maintain the machine easily for fully open bonnet like replacement of a cartridge type oil filter. Also enough lift clearance helps users' daily maintenance to mower. 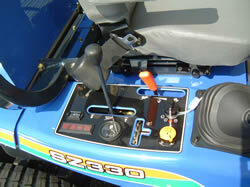 All operating lever, such as steering, are located on both side of operators seat and the floor deck is fully flat. Two HST unit operated by levers are mounted. By tilting the lever forward, speed of wheel each side is increased. Also, by tilting backward, the wheels are driven in reverse. Nimble and quick movement is, then, performed. Various safety system, such as engine safty start, alarm for parking brake before travelling, or rigid rollover protection frame protect users. Also one of the reason of Iseki's a lot advantage is press molding mower deck which will show a customer exellent performace for mowing.